The researchers from Wageningen University and Research Centre in the Netherlands managed to grow tomatoes, peas, rye, garden rocket, radish, garden cress, leek, spinach, quinoa, and chives in the soil. "The total above ground biomass produced on the Mars soil simulant was not significantly different from the potting compost we used as a control," researcher Dr. Wieger Wamelink said in a statement. The team also grew the same 10 crops in soil that mimicked moon sod, but found that their harvest was only about half as successful as the Mars crops. In particular, spinach seemed to struggle in the lunar environment. The soil, provided by NASA, mimics Mars and moon soil as closely as possible. The Mars simulant originates from a volcano on Hawaii, while the moon sod comes from an Arizona desert. When compared to the control sod, which can be found at any local gardening center, the Mars simulant soil turned out to be just as hospitable for crops. “The growth on the Mars simulant soil was equal to what we used for the control, so that is really a nutrient rich potting soil. And that was a big surprise to us,” Wamelink told RT. He went on to compare the outcome to the Hollywood film 'The Martian,' in which Matt Damon managed to grow food on Mars, against all odds. “When I look at what [Matt Damon's character] Mark Watney did on Mars, in planting the potatoes, I think that's quite plausible and possible because that's basically what we [have done] and are going to continue to do,” he said. The experiment involved cultivating the plants in a glass house under constant temperature, humidity, and light conditions. "This is because we expect that first crop growth on Mars and the moon will take place in underground rooms to protect the plants from the hostile environment, including cosmic radiation," Wamelink said in a statement. But despite the successful harvest, the team refrained from eating the crops. "The soils contain heavy metals like lead, arsenic and mercury and also a lot of iron. If the components become available for the plants, they may be taken up and find their way into the fruits, making them poisonous,” Wamelink said. The research began in April 2015, with the final harvest taking place in October 2015. The experiment followed previous research by the same team. However, Wamelink stressed that changes were made this time around. 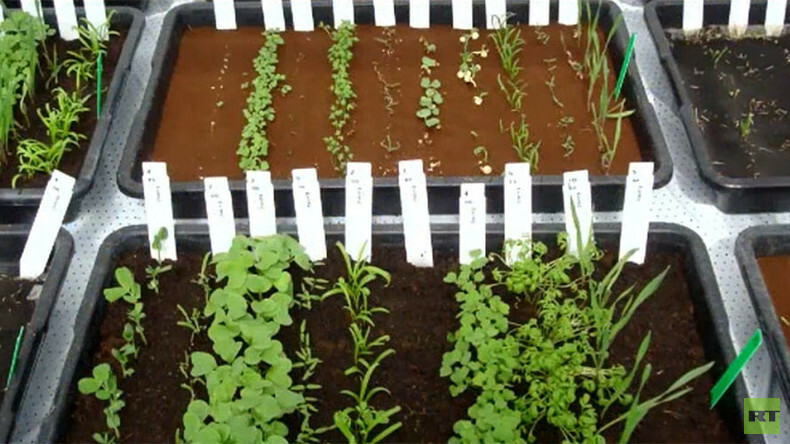 "We used trays instead of small pots and added organic material (fresh cut grass) to the Mars and moon soil simulant. This solved the problem we had with watering in the first experiment and also added manure to the soils." Most of the plants had died in the first moon soil experiment, but the moon soil crops showed the most improvement with the changes. Further research on the safety of eating the crops grown in the soil simulants is scheduled to begin in April. The study, which is being financed by crowdfunding, will involve the growth of a new batch of crops, including potatoes and beans. If the crops are found to be safe enough to eat, the funders will be invited for dinner, where a 'Martian meal' will be served with all the trimmings – including the harvested crops.